It is customary to have a memorial guest book so that guests and visitors can sign in when they walk in through the front doors of the memorial service. A way for the family to remember who attended the service and have a remembrance from the service itself, choosing the right memorial guest book and individual to attend to the guest book and oversee the signing process is of great importance. Guest books are available with many customizable and personalization features to make it more of a keepsake for years to come. Memorial guest books are a way to create a keepsake for the deceased person’s family. Everyone who signs in should have the opportunity to leave a personal message. Additionally, family and friends can be invited to bring photos of the loved one and themselves to the services so that they can store it in the memorial guest book. This personal addition of pictures and written sentiment to the memorial guest book itself becomes a keepsake treasure for years to come. It is more special because it’s made up of all the memories that the deceased person shared with other people. In designing the memorial guest book, you can also make it a lot more personal and extraordinary than ordinary guest books that you can buy at the store. You can include all sorts of photographs, lists of hobbies and interests, what kinds of foods they liked, where they went to school, where they were employed, what kinds of clubs that they belonged to, and what kinds of hobbies that the deceased person had. You may include notes of this throughout the guest book, or include all sorts of facets of the deceased throughout the pages. Pick a three-ring binder that is large enough that you can customize it with multiple sections such as family, life events, passions and hobbies, friends and anything else that was special to the deceased. Have a section for the guests to sign in and a section of representative items and symbols such as a family crest or other personal symbolizations that you can include in the guest book. How Will the Memorial Guest Book be Used Later On? You’ll basically be creating a keepsake for the living loved ones of the deceased which they can look through in later years. They will be able to read the personal messages that the friends and family members in the guest book when they signed in, because you will have instructed them to write personal messages, and you will be able to look through all the symbols and items that were added in as a part of the guestbook to make it more personally memorable and true to the person whose memorial service it was. 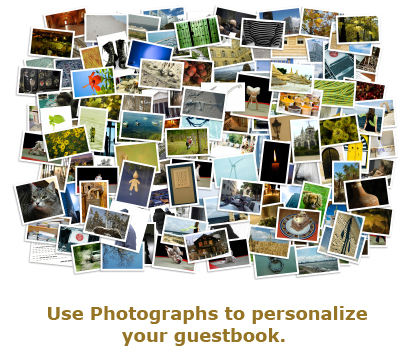 Have a section where guests can leave a card with a favorite photo. Collect these in the binder to look through them at a later date. You can also have a page for your own farewell message, or farewell messages that others want to leave. A section that lists who sent flowers to the family, who assisted with meals and time and who simply has been there can be added to the memorial book as a way for family to remember and appreciate those that made a difference during such a difficult time. Creating your own memorial guest book lets family capture the life and personality of the deceased and honor them in a way that is unique and individual. The guest book should reflect everything imaginable of the deceased, all the many different things that made them special. Personalized memorial guest books are a great opportunity to create new memories out of all the potential unique farewell messages, cards, gifts, and notes from loved ones that attend the memorial service. It’s also a way to allow those that come to bid farewell and pay their respects to the deceased to take part in a personal memoir that honors someone they knew and cared for. There are a lot of vendors and online retailers now that make it simple to customize a memorial guestbook online so that all the work is done online for you. This allows for easy personalization and easy to follow steps that make creating a memorial guestbook trouble free. Most online retailers give you options with different templates. You’ll have the chance to fill in personal details of what you want the memorial guestbook to look like from the exterior cover to the interior pages. Creating a memorial guest book online is simple, and it’s often a lot easier than handcrafting one at home. You can always go to an art supply store and get the materials needed for fashioning your own memorial guest book at home. You can easily pick up all the supplies you’d need at one art supply or craft retailer. The salesperson should be able to assist you with all that you will need from the binder to the pages to other scrapbooking supplies that will enhance the personal nature of the book. Different pens such as metallic pens or calligraphy art pens and colored linen pages can make for a sophisticated and vibrant finished product that families will treasure for years to come. Children, extended family and close friends and relatives can take part in the initial set up of the memorial book. Have all the relatives come over and add their own personal flair to the guest book or do an individual page so that the book has already taken on the personality of the deceased when the guests start arriving at the service. In the end, you’ll have an amazing memorial guest book that was customized in multiple ways and left people with countless memories. The memorial guest book gives families something to look through and pass around to all your relatives so that all that can find comfort, love and laughter in the many memories of the deceased. Creating a personalized memorial guest book is a new trend in memorializing for families and is a great way to get the entire family involved. There is no right or wrong way to create a personal memorial guest book in honor of the deceased. It is about love and having a tangible memory that you can have and treasure forever. It is also a way to pass down a family heirloom to further generations to learn about their family history. A personal memorial guest book is a great way to share memories and have a sentimental reminder of those you’ve lost. Take the time to make the memorial guest book a customizable piece of treasure that everyone can learn from, laugh about, cry over, and share for many decades to come. Have more questions? We can help! Contact our customer service at 1-877-723-4242.